Soldier of is a new action RPG by Indie game developer SolarLune. The game is based on Blender Game Engine and has a very retro feel and style. 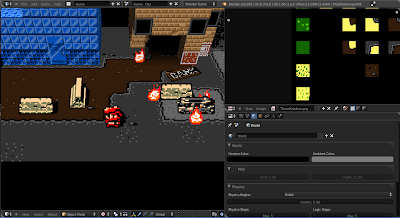 Though the Blender Game Engine can produce high end 3D graphics and animations, the 2D animation sprites are designed on purpose to keep the retro feel and game graphics look like old GameBoy Color games. Soldier Of will aim to be a top-down 3D GBC-inspired action adventure game, not unlike Link's Awakening. I hope to have some platforming and puzzle elements as well, but mostly, there will be action, shooting, dodging, etc. The plot, names, dialogue, and pretty much everything else in the game are all tentative, and subject to change. It's all pretty likely to change, really. I don't want this game to be any kind of standard, "It's a warzone; shoot everyone" kind of game - I want it to have the heart and plot that really makes you love it like many retro RPG and adventure titles had. So, I don't think the 'It's an alien invasion' plot will work. So, that means that the plot will have to be strong, which is good. Soldier Of is being made in the Blender Game Engine, which allows for rapid game creation and good cross-platform compatibility (Windows, Mac, and Linux support). There is no playable demo at the moment, but the game is under heavy development. Check out the devlog videos below. More on Youtube Channel.